The Truffle of Sauce Grande, a delicious faux truffle of garlic foam with delicate garlic aromas, is a creation of Chef Digilio of La Vineria de Gualterio Bolivar in Buenos Aires. During our interview with Chef Digilio, he shared with us his acclaimed recipe with step by step instructions and prepared it in front of our camera so we could capture all the details! The faux truffle is a foam of garlic cream (triple cooked to remove the aggressive flavor of the garlic but conserving a nice aroma) that is breaded in a mix of cereal bread, black olive powder and pepper. To create more illusion and confusion, the faux truffle is served next to a small jar (same as the one used in preserved truffles) that contains a consommé imitating the juice of preserved truffles. Like most of Chef Digilio’s dishes, the Truffle of Sauce Grande has a tale or memory behind it. When Chef Digilio was creating this menu, he remembered a friend who used to say (and continues to do so) that he could find truffles in the forest of the river Sauce Grande (found south of Buenos Aires Province). But it is impossible to find truffles in that forest, so as a joke, Chef Digilio created this truffle dish which has nothing to do with a truffle except that it looks like a truffle. 1- Cook garlic cloves for 10 minutes at 70 °C (158 °F) in the olive oil. 2- Remove garlic cloves from olive oil and cook them in milk for 10 minutes using a clean pot. Bring milk to boil and then lower heat. 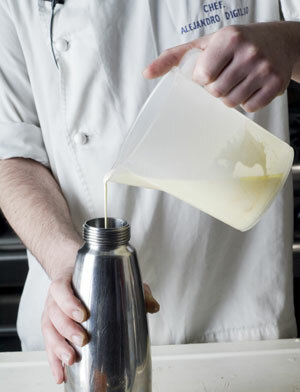 3- Remove garlic cloves from milk and cook them for 10 minutes in the cream using a clean pot. Bring cream to boil and then lower heat. 4- Remove pot from heat, cover pot and let it rest of 10 minutes. 5- Blend cream and garlic using an immersion blender. If mix is too dense, add some fresh milk. Add salt and pepper to taste. 6- Pass mix through a fine sieve. 7- Pour mixture into ISI Whip without any nozzle, screw 1 cream charger (2 if using 1L ISI Whip) and shake vigorously after each one. 8- Refrigerate for 12 hours. 1- Process dried cereal bread in food processor. If bread is too fresh, just bake fresh bread slices at low heat in oven until slightly dry. 3- Mix grated bread, olive powder and pepper. 1- Place a dollop of garlic foam on a spoon using the ISI Whip without nozzle. 2- With another spoon, cover dollop with bread crumb mix. 3- Carefully place garlic cream dollop on bread mix and cover it completely with the bread crumb mix. 4- Place the faux garlic truffle on an appetizer spoon on a plate. 5- Fill small jar with warm beef consommé to resemble an opened jar of preserved truffles. Thanks to Chef Digilio for sharing this amazing recipe with MolecularRecipes.com !